When did Christians first start praying to the saints? I was taken aback. All of historic Christianity! As best I can tell, the practice of asking deceased saints to pray for us is not mentioned anywhere in the New Testament. I have also never encountered the practice being encouraged or even mentioned among the earliest Church Fathers. So my question is really simple: When did Christians first start praying to the saints? Whatever you might think is a good or a bad practice, what’s the earliest documented example of the practice? That’s the question. When I raised this question on Facebook, I was met with a reply consisting of a large chunk of text copied and pasted from what I gather was Catholic apologetics source. All that was offered in regard to the early church was a list of times when somebody had stated that angels and saints pray, and that they pray for people. If you are tempted to reply with this sort of evidence, please don’t. I am aware of that sort of remark in, for example, the Shepherd of Hermas, Clement of Alexandria, Origen and Cyprian (third century), who said that the saints in glory pray for others. The earliest example that really answered my question was from AD. 300, in an anonymous funerary inscription. The dead man is asked to rest in peace and to pray for us. So that is the beginning of the fourth century. When assessing the apologist’s claim that Asking the saints for their intercession is a basic part of all of historic Christianity, a first occurrence coming from an anonymous source at the start of the fourth century would appear to show, at the very least, that there is no evidence of this very strong historical claim. Does anyone know of an example prior to the fourth century of Christians being enjoined to pray to the saints and ask for their intercession? Please treat this solely as a historical question. Any barbs about differences between Catholics and Protestants will probably be removed. Also, please only provide a response and / or a source if it directly and explicitly answers the question. That may seem like a condescending thing to say, but when I first asked the question, the evidence supplied was actually evidence of a different claim, namely that Christians believed that saints on the other side prayed for us. That’s not the issue about which I am asking here. I only want to know when and where the practice began, and if there is a source demonstrating this earlier than the fourth century. Posted on July 26, 2015 June 13, 2018 by GlennPosted in Christianity, church history, theology and biblical studiesTagged catholicism, church history, ecclesiology, Mary. While I don’t know the time period and genesis of such a practice, my experience in Ethiopia with the Orthodox Church here has taught me that the practice of appealing to the intercessory power of saints is due to Monophysitism. In this doctrine, Christ’s two natures become one, and His humanity is subsumed (consumed?) by His divinity. Hence, the remains no longer a human intercessor for the Christian, and Mary, angels, and saints take that role. I hope that helps. There is a prayer to the Theotokos (Mary), “Beneath Thy Protection”, dating from about 250AD. Earlier than that, there are references to the veneration of relics in the Martyrdom of Polycarp. There are references in the Martyrdom of Ignatius to his intercession after death. The intercession of the dead in 2 Maccabees. And there are other references to angelic intercession in the Deuterocanon, as well as the Book of Enoch, which, while apocryphal, at least shows it as a Jewish custom. How widespread can only be speculated. But if you want something from the canon accepted by Protestants, Revelation has Saints under the altar interceding and wondering why God doesn’t wrap this whole thing up already. So there is plenty of support for the view that the intercession of the Saints is a doctrine held “always, and everywhere, by all”. Personally I find the “argument from silence” convincing regarding the seeking of Saints’ intercession, but you may not. It just doesn’t seem like it was a controversy that cropped up in any major way until the Reformation. Chris, I don’t think you are correct, Monophysitism only reared its head in the 5th Century, and the Chalcedonian Orthodox (ie. us Greeks, Russians, Antiochians etc.) from whom those cburches split also seek the intercession of the Saints. “Theotokos (Mary), “Beneath Thy Protection”, dating from about 250AD.” Mary became the Mother of God/Theotokos in 431 CE at the Council of Ephesus. That is two centuries later than your quote. Which shows that your belief about when Mary was first called the God-bearer is false. Jeremy, you alleged that Mary didn’t become theotokos until centuries later, but here’s a quote proclaiming her the God bearer, centuries before you say she “became” the God bearer. You said “Mary became the Mother of God/Theotokos in 431 CE at the Council of Ephesus,” in a context so as to imply that before this Council used that term, Christians did not regard Mary as the God-bearer. But the existence of this quote shows that this claim is not correct. I liken your comment to Mark 16:1-8. Yet, you will state that I am wrong. That Mark 16 finished on verse 20. However, the oldest biblical manuscripts (MSS) including the Codex Vaticanus and Sinaiticus both end on Mark 16:8. yet, we only see the long version late 4th or early 5th centuries. So am I to presume that the later version is superior to the oldest? Veneration of relics is beyond the scope of my question, and as I understand the 2 Maccabees reference (you didn’t provide details), it’s a solitary case of a prayer being made for people who have just died (unless I am remembering it wrong), not a case of people asking the dead to pray for them (a second issue is that I have asked about Christians). As I said in the post, I only want sources that are directly about the question, because an issue like this can quickly skid out of control over all sorts of ecclesiastical disagreements. Remember, too, that the issue is not intercession, but praying to departed saints, asking them to intercede. I tried to almost over-stress this to make sure that the evidence was explicit and on target. So, with that point reiterated, Blair, it would appear that what you’ve offered falls outside of the issue I’m asking about. It still looks, then, like the fourth century is as early as it gets. Should add one more thing – setting aside historical and even Biblical texts, the question boils down to whether the resurrection is REAL or not? Does Christ cause His Saints to live? Is He the God of the living or of the dead? If He is the God of the living (as Scripture clearly states), then we cannot believe in a walled Arcadia heaven, but a dynamic interactive heaven of union with Christ. Does He act alone or in concert? Again, Scripture tells us He does not act alone – He sent out the 70, and when He did so, nobody they came across said “no, I won’t accept your ministry and healing, I am waiting on Christ Himself!”. They accepted the help of the Saints as ministers of Christ on His behalf. They are alive, and remain alive, and with Christ they vivify the whole world. Okay Glenn, fair enough but I mentioned a bunch of other things that did address your question. They are covered at the link quite comprehensively. I think you also need to recognize that if Saints do intercede, it is no stretch for us to ask them to do so. The onus would otherwise be on you to show why departed Saints can talk to God, and we can talk to God, but we can’t talk to the departed Saints! When it comes to historical questions that are requesting evidence, the issue of “onus” is irrelevant. The question is just: What’s the earliest evidence? The onus is on anyone who wants to answer. I almost removed your comment about the resurrection being real, Blair. Please, you must respect my request when commenting on this thread. I will not allow an ecclesiastical dispute to be implied here. There is one and only one question that I am willing to entertain here, and it is a very specific question about historical evidence. That is all. I have looked through the article that you linked to. As I’ve already said, I am aware of some earlier sources that claim that the saints pray for us, so the example of Ignatius doesn’t seem to hit the mark here. The same is true of the examples from Clement of Alexandria, Origen and Cyprian. These examples say that the departed saints pray for others, but that wasn’t the question here. The John Rylands Papyrus 470 is an interesting one though. It is fragmentary enough that there’s no context, but yes it would be the oldest candidate for any prayer intended to be heard by Mary, mid third-century. It wouldn’t support (not directly at least) any claim that there was a wider practice of asking the deceased saints for intercession, but it would be the first when it comes to Mary. There are many such stories from the saints and martyrs of the first several centuries. Glenn, you might wish to check out https://energeticprocession.wordpress.com/2011/07/29/prayers-to-saints-in-the-pre-nicene-era/. It cites an early 3rd century quote from Hippolytus “praying” to Shadrach, Meshach and Abednego, though this could be read as poetic licence. Also a quote from Origen about offering supplication to the saints, though it’s not 100% clear to me that he is referring to departed saints. Also the Rylands papyrus. The quotes from Hippolytus and Origen are likely to be earlier than the papyrus. Giles: Yeah, the Shadrach, Meshach and Abednego example does seem more poetic, as though asking courageous figures in the story to inspire us now with the same courage. I agree that the Origen example doesn’t obviously refer to departed saints. James, unfortunately your example of Thomas falls outside of the question I have asked, as it relates to the use of Holy Relics, not prayers tot he saints, invoking their intercession (unless I have misread). Incidentally, when did St Dimitri write that, and when is the earliest witness to it? I wrote the above before reading your second example, of Matthew. This, too, falls outside of the scope of what I have asked, as it is a case of the use of holy relics. So at this stage – based solely on the evidence – it looks like we have a fragmentary example from the mid-third century, which in context may have been a prayer to Mary, and it looks like the practice developed from there, with prayers to the saints more broadly beginning to appear in the fourth century. It should be easy enough to track down. Just find the first century Roman tax department records and find the first christian businessman who received a notice they were going to audit his last 7 years accounts. [W]e pray you, the most excellent among women, who boastest in the confidence of your maternal honors that you would unceasingly keep us in remembrance. O holy Mother of God, remember us, I say, who make our boast in you, and who in august hymns celebrate the memory, which will ever live, and never fade away. [Oration on Simeon and Anna 7 (c. A.D. 300)]. – [The Teaching of the Twelve Apostles or Didache. (c. A.D. 50-150)]. Lastly, I won’t go into, but I would bring up the notions about arguments from silence, positive evidence in relation to silence, or the conditions for silence to carry evidential weight, but you are a top notch philosopher so I know you know! What is being asked here as well, seems to require that the scope of relevant data be artificially restricted (which is fine, since it is your question!) I would say that this form of epistemic reductionism applied to historical inquiry by which one excludes a priori the evidential relevance of proximate data on the basis of an assumed discontinuity (which is not what I am saying you are doing, but what some anti-Catholics do) is a violation of the principle that proximate evidence informs underdetermined evidence, because such reductionism presupposes discontinuity by interpolating discontinuity into the methodology. Likewise, the positivist methodology of historiography by which one presupposes that there is no evidence for an event or entity at time t, unless there exists presently documents written at time t about that event or entity is a violation of this principle, again because such a methodology unjustifiably loads the presupposition of discontinuity into the methodology by unjustifiably disallowing proximate data to count as evidence. I only bring this last point up, because I can site about 12 sources for intercession of the saints past within the 4th century. I do not know what the term “epistemic reductionism” means here, other than: Asking a question about a particular body of evidence. If that’s what it means, it seems like a perfectly fine thing to engage in. You cite the Rylands Papyri and the example from Methodius, from the fourth century, which is consistent with what I’ve seen so far. Most sources give AD250 for the Ryland papyri, as I noted earlier. But the earlier sources are less clear. The Didache, for example, is definitely not an example of praying to the saints and asking them to intercede. Instead it is a case of believers being called to reflect on the words of the saints. Regarding the various inscriptions, we would need some context. For example, are these funerary inscriptions? If so, I don’t think we can read anything into them. Funerary inscriptions, even today, often contain farewell messages for the deceased that they are not expected to actually hear, but which we expect to apply to them nonetheless (for example “go to your reward,” “rest in peace” etc). If Christians believed that the departed continued to pray for us, then it wouldn’t be surprising to see such things there. But that would be different from a piece of writing, say, a year after the death of that believer, where somebody was petitioning them to pray for us. See what I’m getting at. So it still seems like Marian prayers possibly began to arise in the mid-third century (I say possibly because we lack the context for the saying in the Rylands Papyri), and the practice of including other saints, as far as we can say for sure, began to occur from the fourth century. Or it doesn´t have anything to do with the subject? Hi Tito – What you’re referring to is Graffiti, and it’s not an exact science determining when the graffiti was added. Still, the late third century is theoretically possible, and is later than the earliest example I’ve found so far (mid-third century). So it looks like we can’t find the practice of praying to saints any earlier than the mid third century. When I am referring to reductionism, I don’t mean metaphysical reductionism or something like that, but rather just the reduction of data to an artificially rendered period of time. To expand more on what I had said, the principle I am referring to is that proximate data informs the interpretation of underdetermined direct data unless there is independent positive evidence of discontinuity (which is why I alluded to silent arguments.) If the data directly pertaining to the event in question is underdetermined with respect to its ability to indicate which of the available theses is correct, then data proximate to the direct data rightly informs the interpretation of the direct data, unless there is evidence of relevant discontinuity between the direct and proximate data. This means that when the direct data is such that from this data alone multiple explanations are possible, and the difference between the likelihoods of the explanations is inscrutable without presupposing what is in question, then all other things being equal, the explanation most compatible with data proximate in time and space is to be preferred unless there is independent positive evidence of a discontinuity between the direct data and the proximate data. As a consequence, the likelihood of an explanation of underdetermined direct data is increased by the existence of proximate data that comports with that explanation, all other things being equal. This is a positivist methodology of historiography, presupposing that there is no evidence for an event or entity at time t, unless there exists presently documents written at time t about that event or entity. As you know, positivism in general is a stance of disbelief in certain legitimate ways of knowing, and the attempt to prohibit these ways of knowing from being treated as legitimate or able rightly to relate us epistemically to reality. For this reason, positivism in general is a form of skepticism. Positivist historical methodology is likewise a philosophical form of skepticism, because it artificially and unjustifiably disallows proximate data to count as evidence. I would just point out that this question might adopt this philosophy – in practice – by arbitrarily restricting the temporal scope of data allowed to count as evidence, and then treating anything written outside that stipulated temporal scope as untrustworthy for providing insight into the conditions within that time period, and therefore the positive evidence from proximate data is made to seem to be refuted by arguments from non-evidential silence drawn from the data inside that restricted temporal scope. In this way the method presupposes discontinuity, and thus its results entail discontinuity. The discontinuity it ‘finds’ is loaded into its very methodology. Couldn’t agree more, which is why a put that little postscript about it being a fine question, since it is in fact the specific question you posed. Just curious, is the restriction of the historical data to the 3rd century somehow in relation to The First Council of Nicaea and Ante-Nicene Fathers? I imagine so, and you don’t have to divulge why, I am just curious. I mean, given this data, seems to be two distinct periods when the Church held to the belief that the deceased are actively praying for us, but then there seems to be a transition around The First Council of Nicaea when Christians began to pray to them. I agree. Here are some sources that I think could help to illuminate and provide contextual evidence for why I don’t think a 2nd or 3rd Century Christian would simply be writing these as passive, funerary inscriptions, but rather as supplications for intercession. “A special and fortunate case in this regard is the so-called Memoria Apostolorum in the archaeological complex of the funerary area of St. Sebastian on the Appian Way, where in hundreds of Greek and Latin graffiti the intercession of St Peter and St Paul is invoked or ritual meals eaten in their honour are recalled: “Paul and Peter, intercede for Victor”, “Peter and Paul, remember us”. It can be said that these epigraphs, apparently repetitive, are among the strongest evidence in support of the theory—advanced by some scholars—of the partial and temporary translation of the apostolic relics from their original sites on the Appian Way in the years of persecution under Valerian. While many funerary inscriptions do not invoke the dead to pray on our behalf prior to the 4th century, a handful seem to. However this cannot be an argument against intercessory inscriptions because the opposite is also true; namely that there are many inscriptions during and after the 4th century that do not include intercessory language, but are just general statements about the state of the person’s soul, etc. OK, that seems like a weird way to say it, but thanks. It’s an arbitrary time period I admit, based on a very vague sense of what just seems early. It’s very easy indeed to think of wayward practices developing after a couple of centuries – goodness, there were wayward practices in the first century! It had nothing to do with Nicea, no. I’ll ignore the link to the Catholic apologetics piece in favour of seeing early Christians as having a cult of the dead. Sorry, but all I’m really interested in here are specific items of evidence. I’m also not really interested in discussions of positivism. Whether you like the method of asking for specific evidence for historical propositions or not, that’s what I’m doing. I’ve invited people to offer specific pieces of evidence if they know about them. We can talk endlessly about what we don’t know, and doubtless people are happy to reconstruct undocumented histories in ways that favour their position. Fine, but that’s outside the scope of what I’m asking for. Yes, this seems to be the case, starting (as far as we know) in the late third century, which agrees with the other evidence discussed in this thread. Whether you like this method or not, we only have evidence of Christians offering invocations to dead saints from this time. Thanks for the response Glenn! But can you make make a sort of reverse-anachronistic example like that? Because modern persons write funerary inscriptions that simply “remember the dead” therefore that is the way that early Christians did may have also done it? I don’t really even see this as being pertinent linkage as we should simply focus on the historical and cultural backdrop of early Christians, and not attempt to inject the modern mindset. To further drive home the point about this line of thinking being faulty, there are modern Christian traditions who write epitaphs which ask for intercession of their beloved dead based on the ancient practice of intercessory epitaphs, namely the Eastern Orthodox. Therefore, saying what people do today is irrelevant. Secondly, that is why I linked to the “Catholic” article to show how I don’t think it is merely passive. Totally agree, and I am comfortable with that due to the strong concept of the development of Christian doctrine. So then, why is asking the question “what were Christians doing at time t” so important if we accept the principle of genuine developments contrasted with corruptions? Do you reject this principle? Just curious. Again, this is your blog, so if you don’t like the questions feel free to ignore them since they don’t touch on the exact original question you asked. I don’t think the concept of development should make us comfortable with the fact that wayward practices began to develop. I’ve made no appeal to the development of doctrine, so it doesn’t make sense to challenge me as to why I have asked what Christians were doing at time t. When I noted that wayward practices had more time to come about as history progressed, I was simply trying to help you see why I was insisting on a relatively early time period when asking about this practice. In any event, I never asked what Christians were doing at time t (where t, I assume, represents a specific time). Instead, I have asked when the earliest evidence for invocation of the saints comes from. I trust you see the difference, as well as why this is a worthwhile question to ask. Obviously historical methodology should be where we start, and it is not reasonable to portray us as disagreeing about this. But at some point any historian will roll up his or her sleeves and say OK, what data do we actually have, and how old is it? Maybe I am just not seeing the difference between asking “What (what equals intercession of saints) were Christians doing before time t (where t equals before 4th Century)” and “What earliest evidence for invocation of the saints comes from”. Would you be able to expand on this? Where you see absolutely nothing, I see worthwhile avenues of thought. Just one quick example: If something was believed and practiced from the beginning, and in fact taught by the Apostles in Scripture, then we can glean that it was not a corruption or straying practice that developed later in error. If it didn’t develop (as far as we know) for a few centuries, such a corruption is more of a live option. I didn’t say in this article that this is what was happening here, but the suggestion that nothing further can be gleaned is not true. I noted that I wasn’t asking “what were Christians doing at time t” (your words). Well obviously, I realise that! As I said, I just don’t see how asking for general intercession of the saints is a passive thing to do. Passive would be allowing someone to pray (or simply to be prayed for). Asking for it, whether specifically or generally, is active. First you defended the graffiti as belonging to the late third century. OK, granted. You also objected to a positivist approach to history. I think I’ve covered this, noting that my only purpose has been to ask for specific examples of evidence, which is something that every historian at some point has got to deal with. It never goes away when questions of fact are before us. So I *think* that wraps up our possible conflicts. In addition to some of the secure sources you’ve already been pointed to, I can add a couple more 3rd century graffiti. It doesn’t take you much earlier than your original 4th century example, but it does seem to indicate that the popular practice of asking holy men and women who were believed to be in God’s presence to pray for us and for others was fairly well-established by the (probable) earlier date of Rylands 470. Also from the mid-to-late 3rd century is a graffito from the catacombs beneath S. Sebastiano asking Peter & Paul to pray for someone named Victor. This one is so well-known that it even shows up in a basal Latin language texbook, Wheelock’s; cf. 23 for a plate. It is also used as evidence against the tomb under St. Peter’s Basilica in Vatican City being the actual tomb of Peter, since there was apparently a cult to Peter & Paul out along the Appian Way in the mid-third century. The whole next section of Guarducci’s book (linked above) is meant to discount that as evidence of the location of the saints’ bodies. While these are not examples of Christians being “enjoined to” ask for the intercession of those who have died, I think you probably have enough to safely say that Christians were in fact doing this by the mid-200s. Yes, as unfolded in the comments, the earliest evidence I can see anywhere is in a couple of examples (tombs) some time from the mid to late third century. How widespread it was of course we cannot tell from this. But that’s as far back as things go, and as for actual Christian writing from a Church Father (for example) that touches on it, there’s nothing from the era. You’ve mentioned you know about this source. What is your reason not to see it as an evidence from a time of early apostolic succesion? Me, I’m not sure what to do with this evidence, since it seems to be the only one from such an early period. But the fact that Ignatius stood in an early period of apostolic succesion, seems at least to support the possibility that the practice was common in the early 2nd century – a time very close to the time where the apostle John was still living. What you think? Again, as a Protestant I am still not convinced that this was an apostolic practice Would like to see more evidence too. I don’t use that source because of what it is: A dream about Ignatius praying for people. It’s not an example of people praying to Ignatius. My wife, who is Catholic, pointed out your blog to me (I am not Catholic) and I am fascinated. You seem to be asking an ad hoc question. When did Christians first start documenting their requests for saints to intercede on their behalf? The way you have defined the rules for answering the question, the answer is probably “sometime around 300AD”. So obviously, sometime not TOO terribly long after our Lord died and was resurrected (no more than about 250 years or so), Christians began asking for the departed to intercede on their behalf. They made the mistake of not recording it though. But if that was a mistake, then at least 500 early Christians made the same mistake – those who personally witnessed the risen Christ, because otherwise we’d have at least a couple hundred more Gospels. So what we KNOW is that at some point (300AD by your estimate), Christians began the practice. We also know that not all Christians recorded some PRETTY SIGNIFICANT EVENTS. So I’m going to go with “300AD” as my final answer, and then ask a follow up question . . . your point is? Many historical questions are as ad hoc as mine. You say that “they made the mistake of not recording it.” This is not something you know, however. We have to restrict ourselves to evidence-based answers, or at least that’s what I’ve decided to do here. As for your question “your point is?” I’m not sure I understand. I didn’t make a point. Rather this blog entry was a request, namely a request for evidence regarding the earliest documented appearance of this practice. Not everyone sees a point in acquiring such historical knowledge, which I suppose is fine. But if I had a point, it’s that I want to know, because I have witnessed some strong claims that, as far as I know, are not supported by the available evidence. This suspicion of mine has been confirmed and my question has been answered. As far as I can tell the OT is clear one can only pray to God himself. The NT pretty much proves that point out. Other then in Revelation ch 5 we see a partial worship action going on and the saints offer up the prayers before the throne, but we are seeing the end result not the whole of. Psalm 56:8 8 You have kept count of my tossings; put my tears in your bottle. Are they not in your book? Hebrews 4:16 16 Let us then with confidence draw near to the throne of grace, that we may receive mercy and find grace to help in time of need. 1 John 5:14-1514 And this is the confidence that we have toward him, that if we ask anything according to his will he hears us. 15 And if we know that he hears us in whatever we ask, we know that we have the requests that we have asked of him. Do we take one verse Rev ch 5:8 and throw out the rest of scripture to support an idea born out of superstition? I don’t think we can in fact I know we can’t! Even more important is this why is God God how does he hear and answer prayer? We know God has life within himself, we know he is omniscient, omnipresent, and omnipotent..these are why God is who he is, however no Angel, or saint in heaven has life within them selves, they are not omniscient, omnipresent or omnipotent, and we also know all saints in heaven must eat of the Tree of life. The prayer to the dead and I use dead not as in not living but ones in the faith who have died here on earth and have gone directly to be with the Lord, this idea came out of heresy small at first and then began to spread but the Bile doesn’t teach us this it tells us even by Jesus own command when he was asked by the disciples, we all know what he taught ..”Our father” and if asked in his name Jesus then it would be heard and answered..however this gets clouded over when people become religious and adhere to their particular denomination hard lined, instead of going line upon line, verse upon verse and precept upon precept and the 1st place you find a word in scripture is its main defination. Just pointing out, none of the Bible verses you (Bob Caito) cited tell us that we can only pray to God. Consequently, these these citations do not tell us that we should not ask for the intercession of the Saints. Good blog post, I appreciate the way you laid it out, looking only for specific examples. Unfortunately, I have none to add, but the topic made me think of this whole issue a little more. I think it would be interesting to create another post that tackles the issue from the opposite perspective; that is, when is the first historical document where a Christian leader forbids his/her followers from praying to saints? A quick Google search revealed no results, but maybe I phrased the search poorly. Without any other evidence, the earliest period I can think of would probably be the writings of Martin Luther in the 16th century. 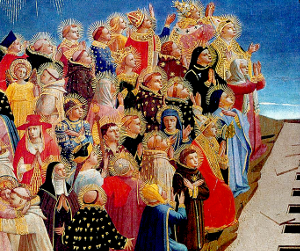 It is clear from the answers to this post that the Christian Church prayed to saints throughout its history, beginning no later than the 3rd or 4th century. It seems as if the whole of Christendom accepted that practice for at least 1100 years. I’m curious if there were any voices that spoke out against it before Luther. I don’t buy that. Samuel rebuked Saul because Saul had turned his back on God. Saul wasn’t trying to grow closer to God, he was just scared of the Philistines. Also, Saul used a medium, in essence having a seance, which no Christian denomination approves of. Any other examples? Dave, that’s not how the occurrence of practices should be tracked. When looking for evidence that something occurred, the best practice is to look for evidence of that practice occurring. In other words, we should believe that something was affirmed just if we see it affirmed. This way we avoid arguments from silence (because we are not claiming that we know something wasn’t going on), we are just exercising humility and saying that we cannot affirm X until a particular time when we have evidence for X. But we don’t assume that a thing is universally affirmed if we don’t see condemnation of the practice. All we can affirm is that we don’t have evidence of condemnation. In order to justifiably claim that a thing is universally affirmed, we would need evidence that something is universally affirmed – which would be a tall order. We can say when we have evidence of when the practice began to be affirmed (as far as we know), and we can know of examples of the practice being rejected, but we should be cautious about trying to make the evidence say more. This is not to say that it wouldn’t be interesting to see when people started reacting to the practice of prayers to saints. The question is not when. One even show someone doing it in Maccabees. It does not mean it was the correct thing to do. If one pay attention to the Maccabees prayer one realizes you cannot pray to have sins removed from one who has died any more than one can be baptized for the dead. It is appointed for man once to die then the judgement. I have been asking a similar question for some time and found the best answer appears to be Old Testament. When Saul queried Samuel for help (1 Sam 28), he was rebuked for interrupting the prohpets rest.